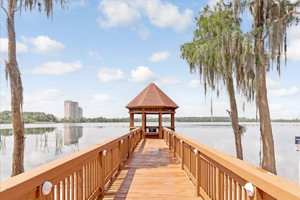 When you stay at Clarion Inn Lake Buena Vista, a Rosen Hotel in Orlando, you'll be connected to a shopping center, within a 5-minute drive of Walt Disney World® area and Orlando Vineland Premium Outlets. This family-friendly hotel is 2.3 mi (3.6 km) from Walt Disney World® Resort and 2.3 mi (3.7 km) from Disney Springs®. Make yourself at home in one of the 640 air-conditioned rooms featuring refrigerators and flat-screen televisions. Your pillowtop bed comes with premium bedding. Cable programming and MP3 docking stations are provided for your entertainment, while complimentary wireless Internet access keeps you connected. Private bathrooms with shower/tub combinations feature complimentary toiletries and hair dryers. Make use of convenient amenities such as complimentary wireless Internet access, concierge services, and an arcade/game room. Additional amenities at this hotel include gift shops/newsstands, wedding services, and a television in a common area. If you're planning a day at a nearby theme park, you can hop on the complimentary shuttle. Stop by the hotel's restaurant, Boardwalk Buffet Rest., for dinner, or grab snacks at the coffee shop/café. Wrap up your day with a drink at the bar/lounge. Full breakfasts are available daily from 6:30 AM to 10:30 AM for a fee. The preferred airport for Clarion Inn Lake Buena Vista, a Rosen Hotel is Orlando, FL (MCO-Orlando Intl. ).